Convenient size + ziplock bag for ease when you are On The Go + need a smaller size! Ground Flaxseed is the Fastest + Best way to get excellent nutrition in your diet! Cold Milled flax seed is optimal for maintaining the Omega 3 oils in flax. 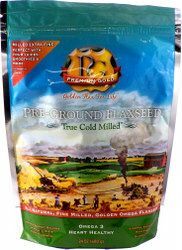 Premium Gold True Cold Milled Ground FlaxSeed Flaxseed is milled so NO HEAT enters the process, much like COLD Pressed Olive Oil. When the Flax seed is Cold Milled, the Omega 3 oil is not exposed to damaging heat and therefore remains unchanged from its seed form. Recommended use: Eat 2-3 tablespoons flax seed daily.